eXtreme Restraints stocks an unusual silicone rope. Need a real long length of rope? 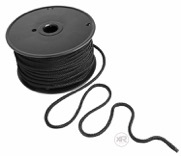 eXtreme Restraints will sell you a 200 foot spool of black 1/4 inch polypropylene rope.